Hoping everyone has been keeping well. I’ve been Ok. Putting a lot of thought into what I eat, not only for health benefits but because of my love for food, I’ve decided to lessen the clutter and go back to simple eating. Fresh seasonal food and quality ingredients.. I love quick meals and enjoy mine mostly with a glass of wine because it makes me happy. Haha! I’ve described my love for bread before I’m sure. I’m very passionate about it. I’m passionate about a lot of carbs.. bread, pasta, maize and potatoes.. I get a loaf once a week, and if I don’t finish it on bruschetta or sandwiches with ham and cheese, I make croutons for salad and soup. I could go on and on.. but let’s get to today’s recipe.. I used everyday ingredients that bring out the best quality in each other without over powering one another. The simplicity in taste but magic that happens when tomatoes meet garlic and thyme.. a splash of balsamic and freshly ground pepper.. ahh.. 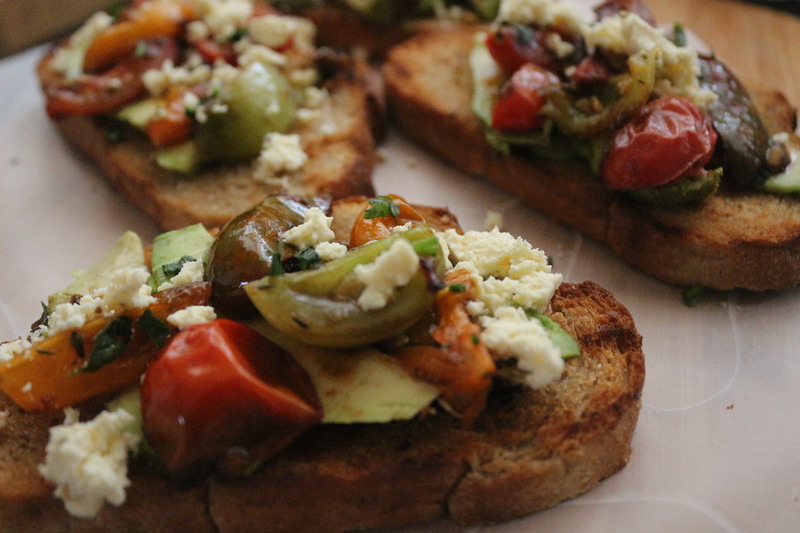 I also used Avo and Feta. Start by thinly slicing your garlic and adding it to a warm pan of Olive Oil.. When it starts to brown add your tomatoes.. some halved and others whole.. adds to the romance I think! Add salt to season and a dash of balsamic vinegar! 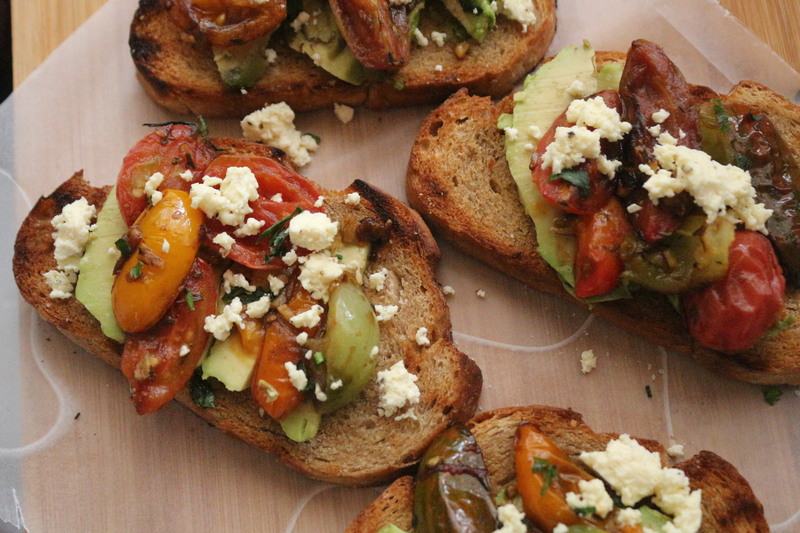 Just teaspoon or 2..
Toast your bread, and layer with Avo and then your tomatoes. Crumble a small amount of feta and crackle a bit of pepper.. I really enjoyed making this and I hope you guys try it too!! Previous Post Mushroom and Parsley Pasta! Next Post Cocktail Pies with Creamy Nola Dip!